OCT is helping his colleague to move house tonight, so I am eating dinner alone. I decided to try another pasta salad because of the hot weather. Judging from the ingredients list,which has all my favorite ingredients; I believe it will turn out well. And sure it does! This is another Rachel Ray's recipe that will be made over and over again! The best part is: it doesn't use mayo or Italian dressing. Which means it's low fat. The pesto and lemon juice used gives the salad a refreshing taste that belongs to summer. For dessert, I make the famous Ina Garten's Lemon Cake. I never have a more lemon-y cake than this, in a good way of course. There was only a second of hesitation, as to whether I should try another lemon cake recipe, but Ina prevailed. So far, I have not tried any Ina Garten's recipe that I don't like! My oven has been resting for sometime now, and I think it's the perfect time to make it work before its owner goes on vacation next week! "Veganism is a philosophy and lifestyle that "seeks to exclude — as far as is possible and practical — all forms of exploitation of, and cruelty to, animals for food, clothing or any other purpose; and by extension, promotes the development and use of animal-free alternatives for the benefit of humans, animals and the environment." In practice, a vegan (an adherent to veganism) commits to the abstention from consumption or use of all animal products, including honey, eggs and dairy products, as well as articles made of fur, wool, bone, leather, feathers, pearls, mother of pearl, coral, and other materials of animal origin. Many vegans also avoid products that have been tested on animals. People who avoid eating all animal products, but who otherwise use animal by-products (for example, leather shoes) are commonly referred to as dietary vegans." 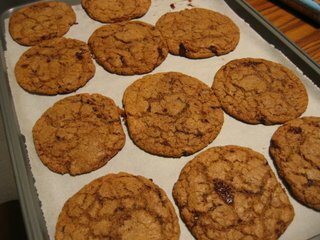 Because I used dairy chocolate chunk in the recipe, I guess I can't call this recipe Vegan Chocolate Chips cookies nor "Almost vegan chocolate chips cookies", so I call it Eggless Chocolate chips cookies! It's a pretty healthy recipe, using whole wheat flour and maple syrup, without butter and eggs. Needless to say, the last recipe wasn't the healthiest cookies I have ever made. This recipe sounds healthy enough though, and I am really curious of its texture and flavor, without the fat from eggs and butter, and the substitution of white flour with whole wheat flour. Because it requires no butter and eggs, this has shorten my baking process tremendously. I don't have to wait for the butter to come to room temperature, and beat with mixer etc. From start time to pulling the cookies out from oven, it took less than 40 minutes. It has an interesting nutty flavor and chewing texture. A healthy recipe that certainly worth trying. One thing to note though. The cookies spread quite a bit because of the lack of structural support from butter and eggs, so be sure to leave enough space between the doughs. 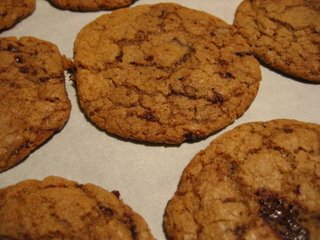 Note: Unbleached all-purpose flour produces a cookie with a very classic taste and texture, but you can use whole-wheat pastry flour and still have delicious cookies! For a wheat-free version, use barley or spelt flour. With spelt flour, you may need to add an extra 2-4 TB of flour, if it is a refined spelt flour. Idea: Make a really special dessert treat... ice cream cookie sandwiches! 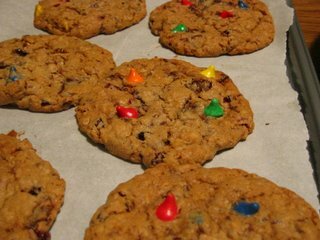 Using two cookies that have been completely cooled in the refrigerator, spread some softened soy ice cream on the underside of one cookie, then place the other cookie on top. 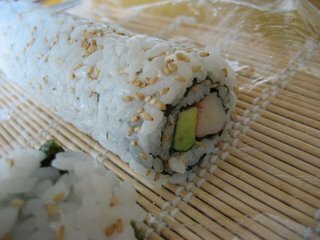 Wrap in plastic wrap and freeze until firm! After knowing that the food in DC are appallingly expensive, I crack my head to come up with snacks that we can bring to eat for our upcoming trip. You have to understand that my husband has bottomless pit, so we really need to bring something that's filling, doesn't require a fridge, and economical. Yes, economical. I sort of feel guilty for making OCT to stretch his budget and bring me to visit Washington DC. So, in desperation, I posted a question on the Cookinglight forum, a forum that I like to frequent but never contribute much. To my surprise, the kind people there have come up with all sort of creative and do-able ideas! One suggested that I bring my cooler bag, which I can fill with ice that hotel provides, so that we can buy milk/ yogurt to eat as breakfast. 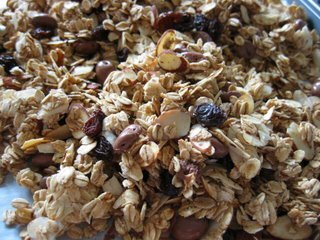 Another suggested me to make homemade granola to eat with the milk/yogurt. And others provide test and true recipes, ideas and tips for cheap eat and must see places. When I told OCT about this, he was quite surprise. He said he didn't know why people could be so helpful to someone they never met. For me, I am touched. And I know I will do just the same for people that need my help. I think sometime we are too involved in our undertaking that we fail to see other's need. We become self centered and selfish and think everyone should fend for themselves and mind their own businesses. Kindness becomes rare, and deems as stupid, and to be taken advantage of. I don't know. This is not the way I was brought up. I grow up in the part of the world where people help one another. Neighbours will help you to look after your house, water your plant when you are away and give you whatever extra fruits that they harvest in their backyard. Friends give you rides even it's out of their ways without you asking. People look after one another. 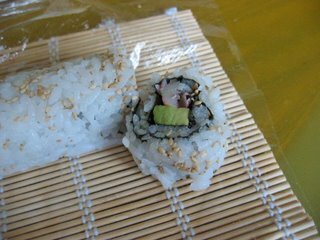 However, I manage to inject a bit of surprise every night, so that we can have something to look forward to for dinner. 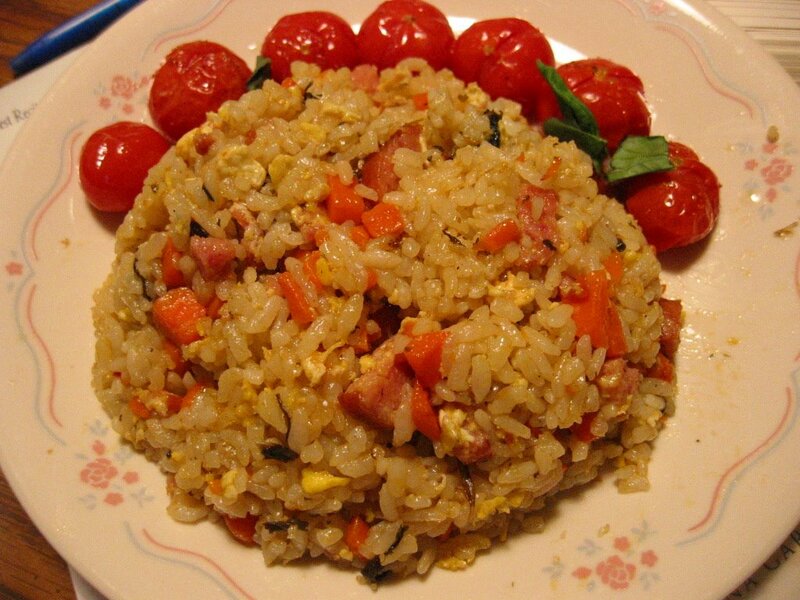 Actually, OCT is easily satisfied with the sight of rice, regardless of the dishes. And I am not particularly motivated to try out new dishes, because I have more EXCITING things to do! We are going to Washington DC this coming Sunday! I have been busy in doing research on the "must see, must go and must eat places in DC". And I am overwhelmed by the vast information the ever wonderful Internet provides. I have our flight and accomodation booked, and itineary planned. Now I only need to think of what cake/ cookies to bake for this coming trip. Allow me to digress from my usually food related entry. I am really excited about this trip. Incidentally, we will be in the nation's capitol on its National Day! I have heard so much about its marvellous firework at night, which attracts tourists and citizens to the Capitol for the event itself. A certain must see! Afterall, we will be conveniencely there, staying just 2 blocks away from the White House. 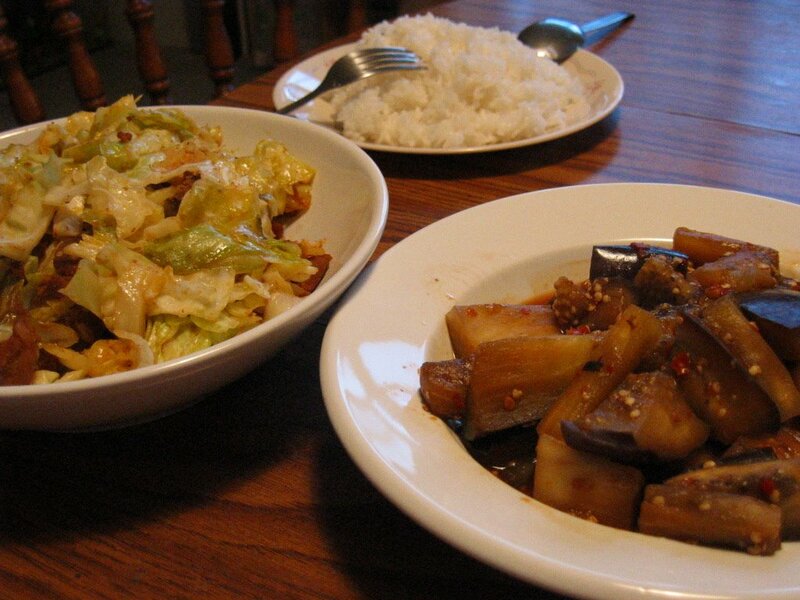 It's a fish dish, which we seldom eat due to the lack of fresh fish here. Or rather the expensive price tag that comes with the fish. 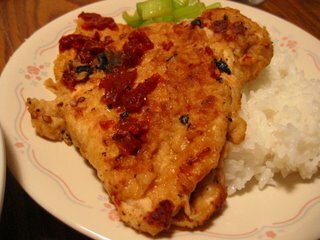 Well, I used frozen tilapia for this dish, and it turned out nice! And I promise that no one will know they were frozen. I don't have the five spice powder, so I just sprinkle the fish with some salt, pepper and paprika before saute. The highlight is really the sauce in my opinion. 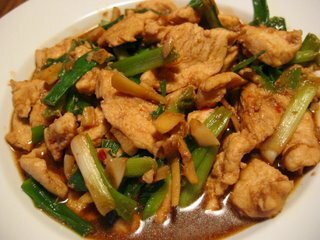 Combine green onions, juices, soy sauce, brown sugar, vinegar, and ginger in a small bowl. Combine five-spice powder, salt, and pepper. Sprinkle both sides of fish evenly with spice mixture. Heat oil in a large nonstick skillet over medium-high heat. 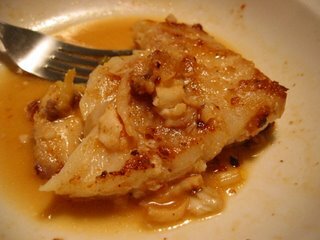 Add fish to pan; cook 2 minutes on each side or until fish flakes easily when tested with a fork or until desired degree of doneness. Remove from skillet. Add the sauce into the same skillet to deglaze the skillet. Pour the sauce onto the fish once it comes to a boil. It should take less than 10 seconds. We didn't go to the Winery again. OCT was not feeling well this morning..Sigh, what can I say? Hope we can go another time. I make a batch of cookies tonight for our picnic tomorrow. After many delays, we are finally going to the winery with our friends! Not that I am an alcoholic, but I am always curious of the wine making process. After graduation, I found myself selling poison to professional. Ok, it's not what you think. I was only doing medical sales. If you look carefully, all the medicines are labelled poison on their insert. So, I can tell people that I made a fairly good living selling poison. I have always wanted to do something related to food. In Uni days, applied Chemistry was the closest thing I could get...Ok, maybe not really close, but definitely closer as compared to Physics or Mathematics or Literature. Poor me who spent so many nights breaking down the complex organic structures into its simplest form; and cracking my head to think of the shortest pathway to make another meaningless chemical structure. I wish I could use some of the knowledge I learnt in my baking. Some people say baking is a science. You must use the exact ingredients to get the exact outcome. I know this too. Did I tell you that I worked in a pharmaceutical plant before? I know how important the exact weight of a certain ingredients, the exact temperature and the exact mixing time are to the final products. Medicines are unlike cookies. No mistake is allowed. And nothing should be wasted. The last drop of liquid may well worth 10- 20 dollar. Yesterday was another hot summer day. And I didn't sleep well for the past 2 nights, so I wasn't in the mood to cook a Chinese meal with different dishes, not to mention the extra plates and bowls that needed to be washed after the meal. I cooked pasta in the end. With the simple combination of white wine + vidalia onion + roast red pepper + lemon juice that guarantee success. I don't know why, but this simple combination will just work! The white wine gives the dish a sophisticated taste that couldn't be achieved using other condiments. Juice from half a lemon added towards the end also brighten the flavor of the sauce!Nowadays I always keep some lemons in the fridge for various uses. Like in the banana cake, pasta dish, sauce and iced lemon drink! I want to tell you about this potato salad I made yesterday. It was so good so good so good! I have no idea that it will be that good judging from the simple list of ingredients. Maybe because I actually follow the recipe, and bother to use my measuring spoon and cups to measure the ingredients. I even use a scale to weigh the potatoes! All these are worth the effort. The potato salad turns out perfect. Maybe my standard is low, but this is exactly how I like my potato salad. It reminds me of the potato salad I had at Starbucks. I know this is weird. It's Starbuck that I found my favorite potato salad, of all places. So, if you like Starbucks' kind of potato salad, have a go at this. It may not be exactly the same as theirs, but it reminds me of them.Not any Starbucks, I am referring to the Singapore Starbuck...The only modification I make is to reduce the mayonaise. Oh, and I used the light Mayo. I can hardly wait to make it again. While doing the research on a potato salad, one site mentioned that the key is to mix the potatoes with the dressing while they are still hot. The reason is because the dressing will coat on all surfaces of the potatoes. Another reviewer, however, mentioned that chilling the potato salad for a few hours is important for the favour to mend. I would have tried both suggestions, if I was not rushing out after the potatoes are cooked. But I did chill the salad for 3 hours! No pics for this recipe though. I don't think the picture do any justice to the potato salad. It just look like the normal, humble potato salad. Serves 5 as side dish. 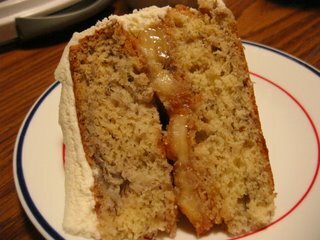 Martha's banana cake tastes nice even without the frosting! In fact, I think it will be better off without the frosting. The cream is a bit too sweet and milky. It is a mascarpone frosting. But I think the only way for mascarpone cheese to shine, is with kahlua and coffee. In the Tiramisu. Not in any other recipe. Well, that's what I think. 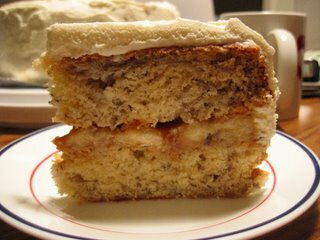 But I like the caramelised banana in the middle of two cakes. 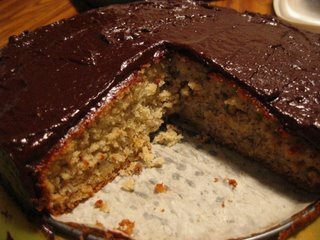 It gives the banana cake its character. The visible banana flesh screams "I am a banana cake, come eat me! ", to me, at least. 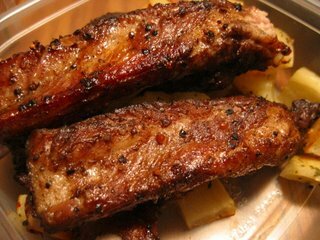 Yesterday night we had spareribs for dinner. I turned my oven to 425F despite the hot weather, and roasted the spareribs for an hour. You can probably imagine how sweaty I was after the cooking. I got the spareribs last week when they were on sale. Nowadays our dinners are pretty much determined by what is on sale that week. I am not complaining. In fact, I find it quite fun to plan for a week's meal based on that. Of course there's exception...Like our last trip to Trader Joe, we actually bought some smoke salmon, black forest prosciutto, Gruyere cheese and Provolone cheese! 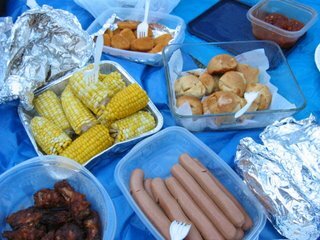 All of which are crucial for scrumptious picnics. Coming back to the spareribs. Usually I like to roast the spareribs "Haiwaiian style", using BBQ sauce and canned pineapple. That is a tried and tested way. But yesterday I was in a spring cleaning mood. So I searched through OCT's box of condiments that he has accumulated before I came. He used to rely on all these ready made, all in one package spice/ sauce before the arrival of his wonderful wife (that's me!!) Since I seldom use any of those, some that he bought from Singapore have expired. I made a mental note to use up some of them as soon as possible. (Like the bak kut teh mix to use up the rest of the ribs) But for yesterday's dinner, I found a packet of Black Peppercorn Grill Mix, that only required 15 minutes of marinate time. And only need to add some vinegar, water and oil. How nice. Normally I will have to marinate the spareribs overnight. It was not bad. 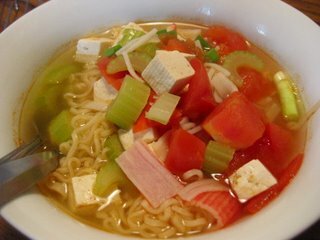 In fact, it was quite delicious, except that it's a bit too dry and spicy. But this can easily be rectified by shortening the roasting time by a few minutes. Definitely something that we can make again when we have guests. I only hope that my memory will not fail me, the way it always do. Either it's the temperature, the cooking time or the ingedients. Most of the time, if it's my own recipe, I can't remember what I have added to the chicken or beef or veggie to make them nice. It's always something extra, which I reckon I will not forget, but forget, and later sulk that I didn't meticulously pen down the recipe. It happens all the time, and if you think I have learnt my lesson, I haven't! Sigh.... Maybe I will start now..Maybe next meal. 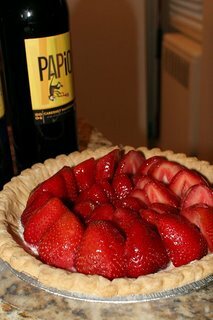 I made a strawberries tart to bring to a friend's house warming last Saturday. When whatever fruits are in season, they are often cheaper and tastier! Noticing the arrival of strawberries season, I have accumulated a few recipes featuring strawberries. Can't wait to try all! 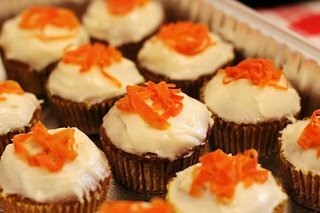 I like the idea of using light cream cheese rather than the pastry cream that other recipes suggested. Guess I am not a custard person... Another simple yet tasty recipe from MS, how can I not adore this woman? 1. Make the crust: Preheat oven to 350°. 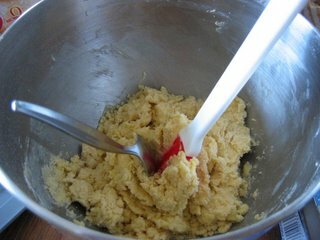 In a food processor, blend flour, butter, sugar, and salt until moist crumbs form (this may take up to 1 minute). Transfer dough to a 9-inch round tart pan with a removable bottom. 2. With floured fingers, press dough evenly into pan and up sides. Dip a dry-measuring cup in flour, and use it to press dough firmly into bottom and against sides of pan. Freeze crust until firm, 10 to 15 minutes. 3. Using a fork, prick crust all over. Bake until golden, 25 to 30 minutes, pressing down gently once or twice with a spoon during baking if crust puffs up. Cool completely in pan. 4. Make the filling: In a medium bowl, mix cream cheese and sugar until smooth; spread mixture evenly in bottom of baked crust (still in tart pan). 5. Starting from outside edge, arrange strawberry halves, stemmed side down, in tight concentric circles on cream cheese. 6. In a small saucepan, heat jelly on medium-low until liquefied. Gently brush strawberries with jelly; let set at least 20 minutes. Chill in pan at least 1 hour (and up to 6 hours); remove from pan just before serving. Note: To hull strawberries, insert the tip of a paring knife below the strawberry's stem. Gently cut around to remove only the base of the stem and the white core. We have a bit of leftover built up in the fridge from previous dinners. So I opt to cook something simple tonight, just for dinner. ( normally I will have to cook enough for the night's dinner and OCT's next day lunch). Tonight's recipe is also suitable to bring to picnic too. Did I tell you how much I love to go picnic? 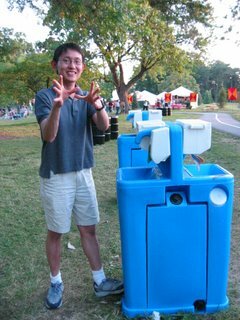 Last Friday we had a picnic with a group of friends before the Julius Caesar play. It was so much fun! Everyone brought something different, and we nibbled a bit of everything. It was quite a feast. Before we knew, we were too full to finish the rest of the food. Guess what was OCT doing? 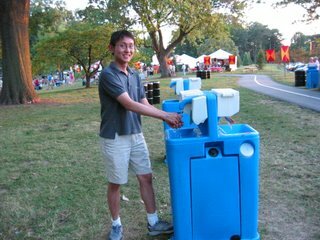 He was washing his hands with the water dispenser! ( actually I don't know what it is called!) There's a pedal where you can step on to get tap water. And there was soap and even papers to clean your hands! What a genius design! I keep pestering OCT on having another picnic soon. "Because," I reason to him, "that now we have the picnic mat, cooler bag, gorgeous weather and thousands of picnic recipes!" 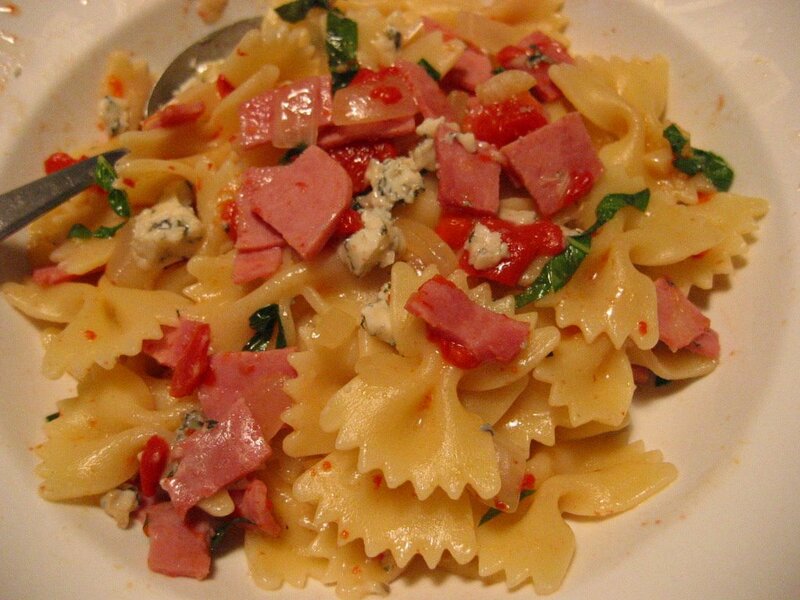 Coming back to the BLT Pasta Salad. It's more like a recipe to use up all the odds and ends in the fridge to me. 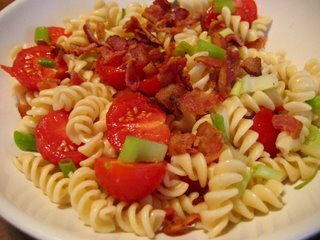 In a chilled bowl, combine pasta,celery, tomatoes and scallions. Whisk oil, mustard, lemon juice and vinegar together in a small bowl. Season to taste with salt and pepper. Add vinagrette to the pasta and tossing warm bacon and shredded parmesan to the pasta just before serving. Tonight dinner features a new condiment- Chipotle Chile in Adobo Sauce. I have seen this being used in a few recipes but never got round to buying it until a grocery trip lately. Chipotle Chile is known for fiery hot, so I am actually expecting something really spicy for tonight's dish. Maybe Malaysians are more attuned to spicy food, I don't find the chipotle chile to be overly spicy. On the other hand, I kind of like the sweetness that the chile added to the dish. OCT thinks the dish is quite good, but he doesn't want to know what condiments I have used. After living with me for 9 months he is finally confident that I am not going to poison him with some exotic ingredients...or rather, he has come to accept his fate. He has to wash down whatever I cook anyway, poison or not. hehehe. I am just kidding on the last part. When I told OCT that I don't really like tonight's dish, he insisted that it was very delicious. To prove his point, he even refilled another bowl of rice. Well, what can I say? One man's meat is another man's poision? Maybe it's good that we have different likings. So that we won't fight for the same food. And let the other have MORE of what he/I likes. This will then lead to the deception that "She loves me so much that She gives up her delicious share for me" and vice versa. Who says couples must have the same taste? Place each chicken breast half between 2 sheets of heavy-duty plastic wrap; pound each piece to 1/4-inch thickness using a meat mallet or small heavy skillet. Combine flour, cumin, and salt in a shallow dish. Dip chicken in orange juice concentrate; dredge in flour mixture. Reserve concentrate. Increase heat to medium-high. Heat pan for 2 minutes or until butter starts to brown. Add chicken; cook 3 minutes on each side or until done. Remove from pan; keep warm. Stir in reserved concentrate, 1/2 cup water, and chile. Bring to a boil; cook 2 minutes. (Thin sauce with 2 tablespoons water, if needed. Serve with chicken. Garnish with cilantro sprigs, if desired. 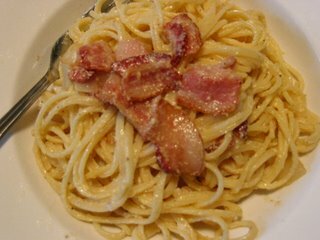 Tonight's dinner is Linguine Alla Carbonara. Something I really like to order in Italian restaurant. The extra creamy and cheesy sauce with crispy bacon bites = very fattening. Because of this reason, I have put off the recipe for some time until tonight. Apparently, this expensive Italian pasta dish is pretty easy to put together, judging from the instruction and ingredients on the recipe. Man am I wrong! It is not as easy as I thought! My supposedly creamy Carbonara comes out a tad too dry, and is not as tasty as I remembered it. The recipe is from Martha Stewart. So it has been to be the user's error. Bring a large saucepan of water to a boil. Heat a medium skillet over medium heat. Add the olive oil and bacon to skillet, and cook until the bacon is browned, 3 to 4 minutes. Remove skillet from heat, and keep warm. Cook spaghetti in boiling water until al dente, about 8 minutes. While spaghetti is cooking, whisk cream, egg yolks, Parmesan, salt, and pepper in a medium bowl until combined. Drain pasta, and return to saucepan. Immediately stir in egg-and-cheese mixture until well combined. Add warm bacon and fat from pan. Toss well. Thin sauce with additional cream, if necessary. 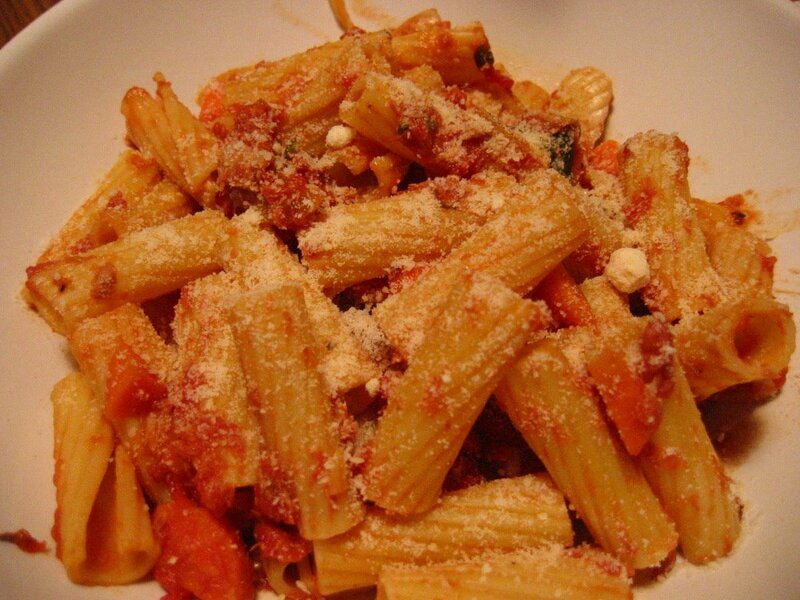 Serve immediately, garnished with grated Parmesan cheese. Our church friends Gary and Jenny invited us over to pick raspberries today after Sunday service. I am thrilled, as this is my first raspberries picking experience. They also invited us over for lunch! So, I thought I should bring something. Maybe some dessert. 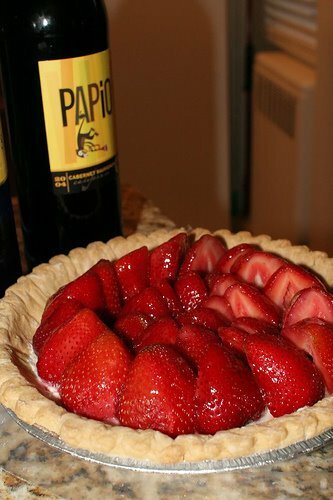 Initially, I wanted to make a Strawberries Tart, but we have run out of strawberries. 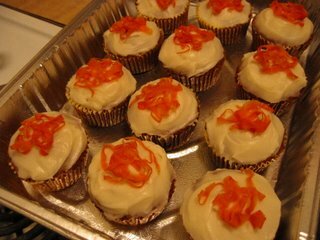 After searching through some tried and tested recipes, I decided to make a batch of Ina Garten's Carrot Cupcakes. The recipe yields 12 cupcakes and one 9" x 9" square cake. We brought the cupcakes to the lunch and wonder what we should do with the square cake.. The cakes are very moist and tender. But we know we could never finish them on our own. So we cut the cake down into several portions and pass them to our friends. Picnic Food : Chicken Satay, sushi and banana cake! I made satay sauce using Ina Garten's recipe yesterday.And it tastes quite like the real thing I had in Sabah. Isn't this ironic? 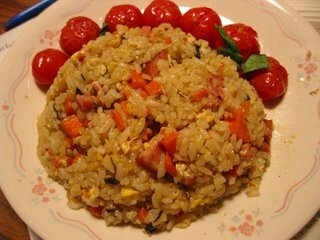 Learning my own country's food from a foreigner? Considering the sauce is made from scratch, Ina Garten's version is really quite authetic. Cook [A] in a small pan on medium heat until onion is transparent. Whisk in [B] and cook for 1 min. Cool and use as a dip for the chicken. This can be kept in refrigerator for a month. When I excitedly present the sauce to OCT, he said it was not as good as the Singapore's version. Well, what can I say? 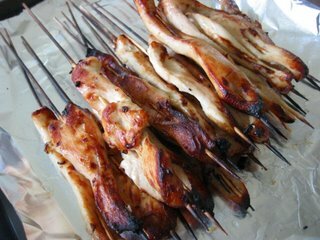 An American's recipe + Malaysian's interpretation is not going to taste anything like Singapore Satay! We then spent some time arguing which country has better satay...quite pointless actually. 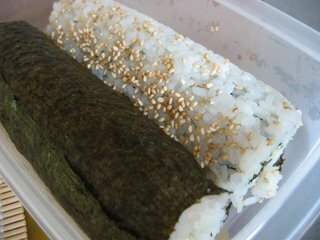 And I also make some sushi, to finish up the nori sheets. 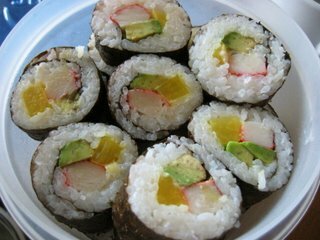 I think I won't have the craving for sushi for sometime after eating sushi twice this week. And a banana cake, using Rose Levy Beranbaum recipe again. 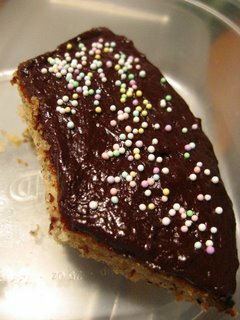 Apparently, OCT's colleagues like my banana cake with dark chocolate ganache! Yeah! And now, I have a few bananas being frozen to be used at a later time. Guess I will stick with this banana cake recipe in the future. 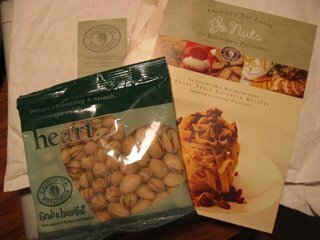 Yesterday, I received a small packet of pistachios and a recipe book from California Pistachios Commission. Yeah! I love samples and I love pistachios! I can't wait to incorporate them in my baking soon. I will be happier if the sample packet could be bigger. Still, a small packet is better than none, right? Yesterday OCT brought the not so yummy penne to school for lunch and dinner. He reckoned that he will need to stay back to prepare his presentation for today's committee meeting. However, my highly efficient OCT called around 7:15p.m and told me that he has completed his work and can come back for dinner instead. He said he would be back by 8 p.m and was REALLY hungry. Uh-oh, I didn't have any plan for dinner...and all the meat was in the freezer. I quickly pull out 2 pieces of chicken breasts and immersed them in cold running water. And ran through all the options in my mind. Something fast and simple......That got to be stirfry. Now come to the sauce. What sauce? We just had the hoisin sauce not long ago. It's too late to marinate it for the scallion & ginger chicken stirfry....Maybe, I will try the shrimp sauce. But has anyone use shrimp sauce to stirfry chicken? It is normally used to fry kangkong, as far as I know.... Time was ticking, I need to take make a decision. So I went ahead to prep the chicken and tossed it with some cornstarch before sauteing. 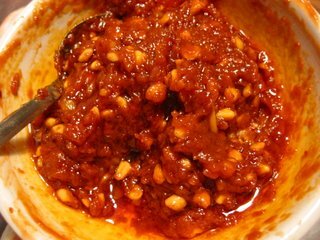 A tablespoon of the greyish shrimp sauce was added, together with a dash of sambal oelek and dark soy sauce. Oh, and some sprigs of green onion and diced ginger. 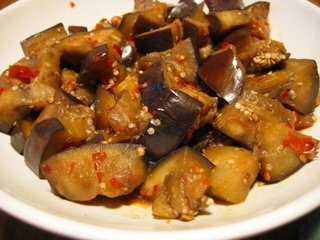 The eggplant is pretty easy, and always a guarantee winner. In case the chicken doesn't turn out well, we will have the eggplant to go with the rice at least. Surprisingly, the chicken turned out to be not too bad. It wasn't a "wow" dish, but OCT seems to enjoy it. He even refilled his rice twice. I suspect he would not eat the chicken if he knew I added shrimp sauce, so I only smile politely and nodding my head when he complimented the dish. Sometime it's funny that I try so hard to make different dishes and yet he could hardly remember what he has eaten. On the contrary, a simple repetoire can make him the most satisfied diner of the world. I went grocery shopping yesterday and found OCT favorite fruit- banana on sale! Usually, it's selling at 59 cent/lb. But I got a full bag of almost 6 lbs bananas for $1.99. The bananas are all in good condition, except a few with dark spots on the skin. A hint of ripeness. For some reason, people here don't like their bananas with spots. But you know what? I like that! Afterall very ripe bananas are what I need to make banana cake / bread! There are of course other fruits like strawberries, mango, grapes etc going on sale. I picked some seedless grapes for OCT's committee meeting tomorrow. Afterall, that's the main purpose for me to go grocery shopping yesterday. After picking up the 6 lb bananas, 2 lb grapes and 2 gallons of milk, I have reached my weight limit and it's time to go. I guess I have to go back sometime later for the red wine that "has a hint of chocolate". I saw that on my way to the cashier. The search continued for hours until I settled for Rose Levy Beranbaum's version from The Cake Bible. The same one I made sometime ago. The next question, is whether to frost the cake or not. It isn't an easy one for me. Weighing between health and taste.. In the end, taste won. I decided to make a frosting. With dark chocolate! Preheat the oven to 350F. Spray a 9-inch round springform pan with cooking spray, line the base with a round of parchment paper, and spray the parchment paper. In a large bowl, stir together the flour, sugar, baking soda, baking powder, and salt. In a medium bowl, mash the banana,and add in sour cream, eggs, and vanilla. Stir them until they are all well mixed together. Add the softened butter and about 2/3 of the banana mixture to the dry ingredients in the bowl. Beat to combine. Scrape down the sides of the bowl with a rubber spatula; then add the rest of the banana mixture, beating just to combine. Pour and scrape the batter into the prepared pan. Bake for 35-45 minutes, until the cake is golden and a toothpick inserted in the center comes out clean and dry. Remove the cake from the oven, let cool for 10 minutes, and then remove the other rim of the pan. Invert the cake onto a wire rack, and carefully remove the base of the pan and the parchment paper. Allow the cake to cool completely. Bring 1/3 cup of heavy cream to a near boil in a small saucepan.When it is steaming well, remove it from heat and pour over the chopped chocolate. Stir or whisk until the chocolate is melted. The mixture should be smooth. 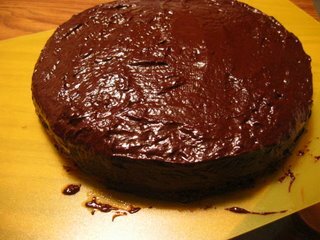 Let stand until the ganache is warm enough to be poured over the cake. This week, I experiment to make crepes. I got the recipe from this month's cookinglight. 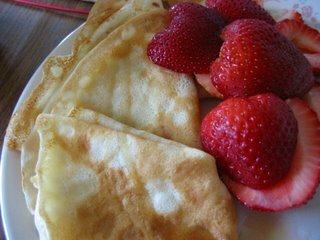 The magazine offers a few variations using the simple crepe recipes. I think it will be a fun project. I remember ordering the ham and cheese crepe everytime I visited Marche back in Singapore. It costed 7-8 dollar for one. Can I reproduce the same thing in my humble kitchen? That's a question I wanted to know too! I gladly put this simple recipe to test and am plesantly suprised by how fun and relaxing the crepe making process turn out to be! I could have make a savory crepe but I wanted to try the original flavor before making the variation version. So I go for the basic crepe recipe and paired them with strawberries and maple syrup later. OCT has three crepes with bacon and cheese filling, and one with his favorite Neopolitan flavor ice-cream. With one recipe, we tried it with savory ingredient, sweet ice cream and simply fruit. One conclusion from this experiment: crepe is nice to be eaten with other ingredients but not alone. 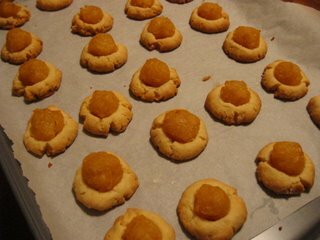 I never thought I will have a chance to bake Pineapple tarts again before Chinese New Year. Frankly, I have quite a thick pile to " to try list" which could last me for months. 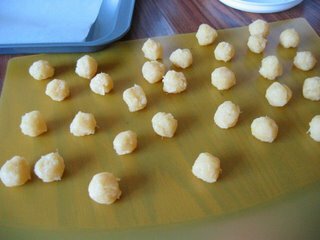 But a friend called and asked if I am interested to help to bake some pineapple tarts for an upcoming event for a good cause. What can I say? I am more than happy that she finds my tarts worth selling! I reckon it would not be too difficult making them myself, since I saw Ying Ying making them back in Singapore before. So I borrowed the bamboo mat from my friend, and gathered all the necessary ingredients needed for sushi making. It's my first time. I am pretty satisfied with the result. OCT however think that they are so so only.....:( ok, there's still plenty of room for improvement..
"OCT, help me to open the new red wine I bought. I need to use it to make beef stew"
"OCT, this wine is delicious, you want to try?" "OCT, you know, research showed that red wine is packed with antioxidant and 8 oz a day is good for your heart too. Maybe I should drink red wine more often. Moreover it's so cheap in the US!" "Do you know research ALSO shows that regular exercise benefits your health?" OCT answered smugly. 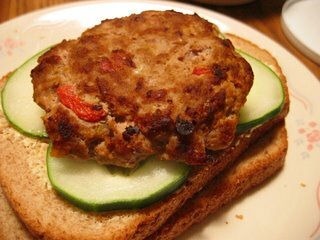 Sunday night, I tried Rachael Ray's Curry turkey burger. It was really delicious! The curry poweder, red pepper and other condiment added a sophisticated taste to the otherwise bland and dry burger. I am only too happy to find an alternative for mince beef. And in my humble opinion, this is even better than the turkey meatballs I made earlier on. Seems like things are getting better over here. Combine first 8 ingredients and form into 5 patties. Brush or drizzle patties with extra-virgin olive oil. Grill patties 6 minutes on each side on indoor electric grill or pan fry for same amount of time in a large nonstick skillet over medium high heat. Pile patties on split crusty rolls with lettuce, tomato, and chutney spread liberally on roll tops as a condiment. Serve curry turkey burgers with Thai Slaw and root vegetable chips.